What Can You Recycle? An Amazing List of What Can be Recycled vs Discarded. What Can You Recycle? Here's an ever growing list of what can be recycled rather than discarded. Here's how to starve the local landfill and reduce your negative impact. 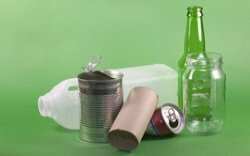 You may be surprised at what can be recycled these days! Anything that can be reused with a little tweaking or that can be broken down into recoverable materials can be recycled. Most landfills now have segregated areas for the disposal of large recyclable materials like computers and household appliances. The number of things that can be recycled far outweighs the things that can't. Reducing, reusing, recycling, composting and donating will almost eliminate the amount of trash you send to the landfill. The local consignment store or internet community list are great ways to recycle large or unique items. 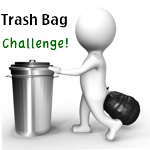 We like to challenge ourselves to produce no more than 1 kitchen catcher sized bag of trash per week but we often do much better than that. Do YOU recycle? Is it worth it? Click to tell us. Have a LOOK at some very creative ideas for recycling old wood pallets! E-Products - What can you recycle? Sell your outdated, underused and even broken, electronics to Buy My Tronics. They'll pay you cash and pick up the postage cost. Most facilities DO NOT accept window glass, crockery, dishes, mirrors or incandescent lightbulbs. In order to control pests and odors you may want to rinse containers but it's usually not a requirement. All colors of glass bottles are accepted, some facilities like them to be sorted by color. Our recycling facility now accepts soft plastic (bread bags, cling wrap etc.) and clean styrofoam trays. Although the technology exists to recycle most plastics, make a trial run to your recycling facility and take note of which plastics they accept. Almost everyone accepts type #1 and #2 plastics. Some accept the whole range from #1 to #7 which includes clamshell plastic food containers and blister packs, plastic bags, along with a gamut of other plastic packaging. Check with thrift stores and Habitat for Humanity and community internet lists. Pizza boxes, wax coated cardboard boxes or soiled/saturated cardboard are not accepted by recyclers. What can you recycle at a Thrift Store or Consignment facility. A growing number of communities have an internet community list where you can advertise just about anything for sale or free for pick-up. Are YOU part of the recycling solution? Blow Your Horn! You deserve it. Tell us about what you regularly recycle and other ways you've kept things out of the landfill. Do you have a curbside program or do you take your recycling to a center yourself? When did you get serious about recycling and why do you do it? What differences have you noticed around home and in the family's attitude since you got on board with recycling? Visitors to our What Can You Recycle page may also be interested in the following pages.